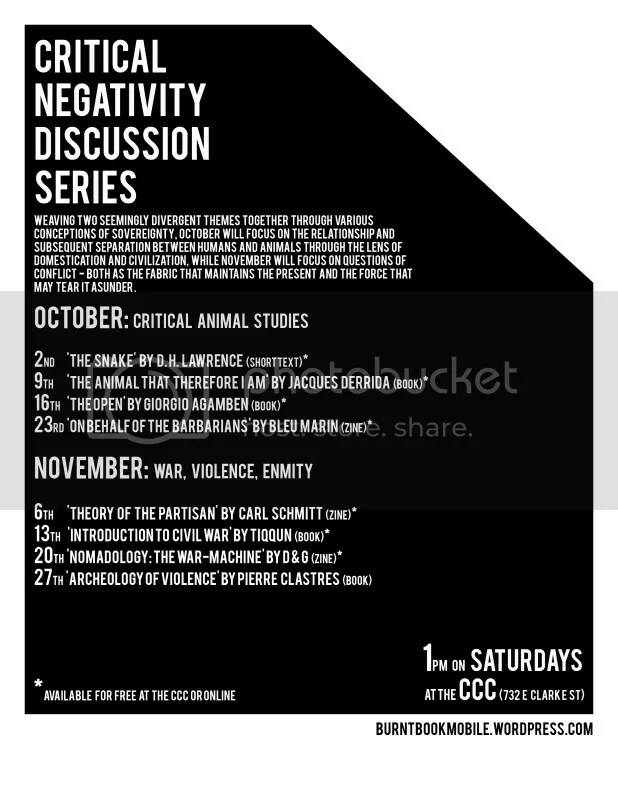 Weaving two seemingly divergent themes together through various conceptions of sovereignty, October will focus on the relationship and subsequent separation between humans and animals through the lens of domestication and civilization, while November will focus on questions of conflict – both as the fabric that maintains the present and the force that may tear it asunder. This series is perhaps considerably less introductory than previous anarchist oriented and theory discussion series that we’ve attempted, though anyone who is interested is certainly welcome to participate. Most of the texts will be available for free to pick up beforehand from the CCC or can be found online to download (and linked to from this post and if made into zines will be added to the zine archive). 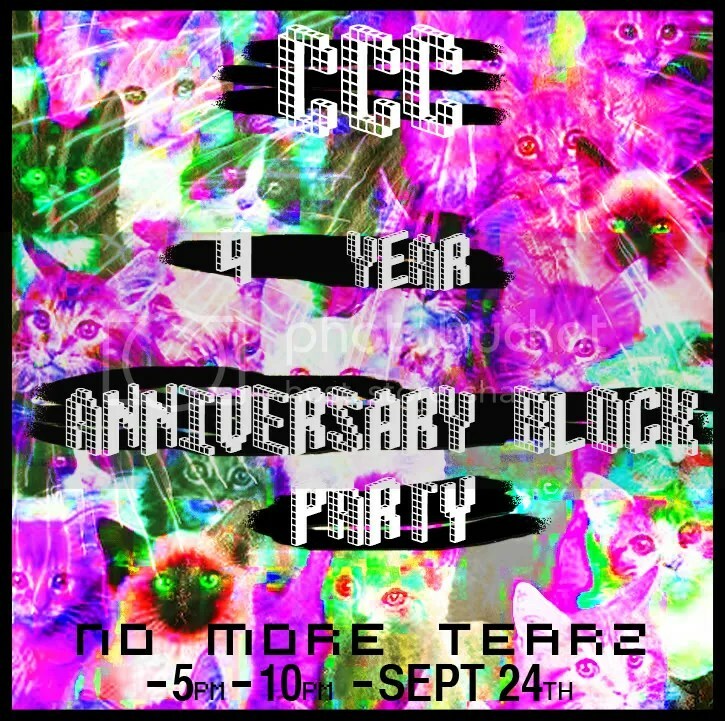 There will be people hanging out, sharing refreshments, listening to music, and so on, to celebrate the 4 years of this Milwaukee anti-authoritarian social center being in existence.
? and root beer floats. Like hanging out, sitting on the ground, talking, staring at each other, playing four square in the street, bike jousting, and so on. “On September 11th, 1973, General Pinochet launched a coup, with backing from the US, and took over the government of Chile. Twenty years ago, in 1990, the military dictatorship transitioned peacefully to a democracy, in which much of the old guard remained in power, and none of the neoliberal economic changes forced through by US-trained economists under the dictatorship were reversed. Every year on September 11th, people again take to the streets throughout Chile to show that the struggle against capitalism has not ended. During the day, in Santiago, there is a march from the city center to the cemetery, where many victims of the Pinochet regime are buried, and at night many of the poblaciones, the peripheral urban ghettos which were major sites of struggle during and after the dictatorship, throw up barricades and riot. In past years, police stations have been attacked, and both police and people have been killed. This year’s march convened at 10 in the morning. Thousands of people were gathered behind a multitude of banners. Hundreds carried red flags with the initials of various communist parties, including the FPMR, a Marxist guerrilla group that engaged in armed struggle against the Pinochet regime. Many Mapuche flags and banners were also present, whereas the anarchists seemed at first to have a smaller presence this year, due to the heavy wave of repression that has been directed against insurrectionary anarchists and that culminated in a wave of raids and arrests on August 14. The march headed north as police maintained a relatively light presence, visibly trying not to provoke any confrontations, while large reserve forces waited generally out of sight, shadowing the march from a block away. The government of Sebastian Piñera, the millionaire businessman from the rightwing National Renewal Party, which supported Pinochet when it was first created, has declared that the upcoming bicentenary celebration on September 18th would mark the end of all divisions in Chilean society. In an awkward call for unity in a televised speech on the 11th, Piñera declared that three out of every four Chileans were either minors or not yet born at the time of Pinochet’s coup, so it made no sense to remain “trapped” in the hatred of the past. Evidently, a precondition for that unity was the suppression of the anarchists. Insurrectionary anarchist social centers in Santiago were raided on August 14, along with several homes, and 14 people were arrested, charged with illegal association and responsibility for the wave of over a hundred bombings that has targeted the institutions and property, but as of yet not the persons, of the elite. The evidence is scanty, and the case is being held together above all by the media. The media, ultimately, would become the major target of Saturday’s march. The crowd of ten thousand chanted slogans, blew horns, and banged on drums as it moved through the streets along the preplanned route. The walls soon became covered with anarchist and Mapuche graffiti, along with the occasional message from the more radical Marxist groups. The traditional Black Bloc had not formed at the back of the march, but when the protestors passed a government building, black masked figures suddenly emerged from within the crowd to smash out all its windows. A few leftists tried to stop them, and the entire crowd silenced them with chants of “los pacos de rojo son los peligrosos!”, the red police are the dangerous ones. Time and again, when anyone tried to stop or discourage property destruction, a large part of the crowd around the anarchists responded with this chant. And generally the crowd proceeded with little incident. A few small fires were lit, a TV van parked along the route attacked, and more graffiti put up on the walls. Finally the march reached the general cemetery where the memorial to the victims of the Pinochet regime is located. A stage had been assembled on the street outside. The speaker spoke of the recent repression and talked about the Mapuche hungerstrikers, the families of those disappeared by police, the miners, the students. Anarchists were noticeably absent from the list, though that same speaker would soon call for solidarity from the anarchists when the situation started to take a turn. At one point in the march about twenty encapuchados, masked ones, ran off to stone police who were hiding on the next block over, though the confrontation was shortlived. Outside the cemetery, the police forces were nowhere to be seen, although a small group of commanders was visible on a distant hillside, next to a TV van, surveilling the protest. Now there were more masked anarchists, and a much larger crowd around them who clearly wanted blood. A slight majority of the mass listened attentively to the speakers on the stage, though almost immediately the communists put their flags out of sight. It seems they have direct orders to take down their flags whenever their might be a riot, so that on the news there are never pictures that show both at the same time. In less than half an hour, the crowd at the back got rowdy. A TV van was parked directly in their midst, and in one moment people began to throw trash and then rocks at it. The journalists quickly got out of the way, and the van had all its windows smashed out, and “the press lies” written on it. The surrounding crowd chanted their approval: “La prensa burguesa no nos interesa!” The bourgeois press doesn’t interest us. Some Chilean and US flags were burned in a barrel, and masked anarchists began taking down the street signs and traffic lights while other people looked on, smiling. The speaker on the stage began a plea for solidarity, asking that the “compañeros” not provoke any incidents, begging people to realize that families were present, and children, and people in the graveyard visiting their loved ones, and indigenous people. The crowd in front of the stage having largely disappeared, the rest of those gathered began whistling and shouting, and repeated the chant about the red police. A few twelve year olds were busy throwing stones, a number of families were watching the fun, people in the graveyard were relaxing, unconcerned by the riot outside until police entered and chased them out later in the day. And as for the Mapuche, they themselves were internally divided on the question of violence and politics, and had no uniform position. Earlier in the week, anarchists and others had come out to a Mapuche solidarity protest that marched up the pedestrian street Ahumada to Plaza de Armas, and their participation was respectful, and without any incident. The September 11th protest, on the other hand, has always ended with riots. The leftist on the stage was ignored, and eventually a group of anarchists broke through the metal doors protecting the metro station Cementerio, which had been closed up for the day. For the next minutes the sound of breaking glass and smashed ticket machines echoed out onto the streets. Still, the police did not come. Some in the crowd wondered, what if they don’t let us have a riot? The neighborhood was not a wealthy one, and the few legitimate targets on that block had already been dismantled. Finally a group of anarchists, followed by many youths and others who wanted a fight, ran up a side street where another media van was parked. They physically attacked a few journalists, who had to run for their lives, and caught another TV van. They smashed it open and looted it, and came back triumphantly bearing a TV camera and tripod, which they threw into their fire. The media would declare the next day that the police had allowed the riot to develop by being too lenient, though in reality things only kicked off because they took the bait. After the second attack on the media, police tanks with water cannons drove up from two directions and plowed through the burning barricades. At first the protestors ran away, but soon they charged back in to attack the lanzaguas.ˆThese tanks are the characteristic crowd control weapon in Chile. They plow through crowds or barricades, and shoot high-powered streams of water mixed with tear gas. Soon the air filled up with the biting stench of gas. A number of carabineros jeeps and armored personnel carriers came behind the tanks, but for the moment no police got out on foot, so there was still no danger of arrest. The crowd charged the tanks, throwing stones and a couple molotovs, and the tanks sprayed at the crowd, which would run back down the street or take refuge in the cemetery. The battle went back and forth for what seemed like half an hour but was probably much shorter, while an enterprising lemon vendor who had been trailing the march set up shop in the cemetery and sold off a hundred lemons to people suffering the effects of the burning gas. A black street dog, meanwhile, braved the tear gas and barked and bit at the police vehicles, clearly on the side of the anarchists. Eventually, when the crowd had been worn down and police considered it safer to send in officers on foot, the water cannons charged the cemetery gate, partially entering, and giving cover to a line of police cavalry that stormed in behind them. Most of the Black Bloc had gone into the cemetery, but as soon as the police contingent advanced in after them, the crowd on the street surged in behind the police, shouting “ahora! ahora!” and attacking them from the rear with a hail of rocks. Police reinforcements rolled up and pushed back the crowd permanently, and a little while later more police vehicles came in from the other direction, dispatching a number of cops on foot, so the crowd scattered. Cops reported arresting about twenty people in the cemetery. The march, though, was just the first event of the day. During the nighttime, every year, people in the poblaciones set up barricades and shoot off guns to mark the anniversary of the coup. This year was no exception. The night before, in the community of San Bernardo, youths erected burning barricades, and three were arrested. On Saturday night disturbances took place in at least a half dozen poblaciones. People burned barricades and opened fire on the police, hospitalizing at least four of the hated “pacos.” Eighty people were arrested.